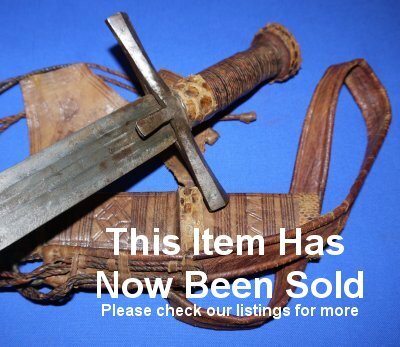 In very good condition, a very well made Sudanese kaskara with crocodile and leather to the hilt and scabbard. A Mahdist War. British war trophy from the Sudan, end of 19th Century, very beginning of 20th Century. Well made, with talismanic symbols to the blade. The 19 1/2 Inch blade has patina / old black rust spots but is still good and sound, and firm in the hilt. 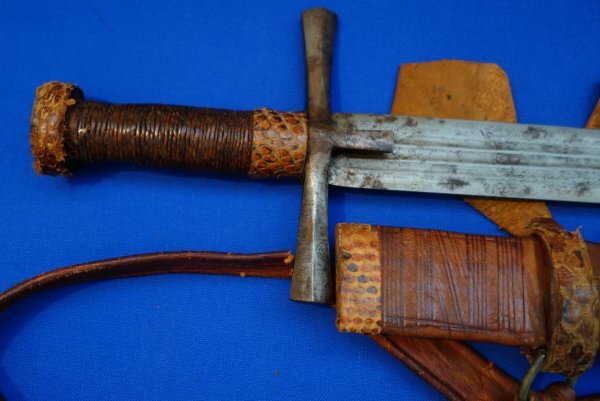 The hilt and scabbard are made from leather and crocodile skin. The sword sheathes and draws well. A well, well above average example. Yours for only £? (too late, now sold - original sales price divulged for small fee). Please quote item reference M20 (1259). Further / full sized images available upon request.